Smart Service janitorial service software for QuickBooks ensures there’s no screen hopping and double entering data throughout the day. If you have QuickBooks, Smart Service is the best option to optimize your janitorial business. The Smart Service software solution talks to and syncs with QuickBooks, so everything you do in Smart Service gets brought over to QuickBooks! Managing janitorial operations has never been easier. Small businesses choose QuickBooks because it makes running their business easier and more efficient. And you should choose Smart Service janitorial service software for the same reasons. Instead of bouncing back and forth between QuickBooks for financials and another system for everything else, Smart Service allows you to do everything with one software. Client information, job details, and inventory numbers will be synced with QuickBooks. There’s no need to open yourself up to error by double entering every piece of important information that comes through your office doors. Smart Service pairs with QuickBooks to take it further and help you manage your daily operations. Linking Smart Service and QuickBooks by importing all your existing data means nothing gets lost in translation. All of your customers and past jobs become part of your Smart Service data file. Once that’s done, every time you schedule a new work order, Smart Service will pull all the relevant data from your existing records. Add job notes or any additional information, and then you can send it straight to your field team with the Smart Service mobile app. Once they’ve completed the job they can update the work order, gather customer signatures if needed, and send everything back to the office for approval. Smart Service takes all this information and updates QuickBooks! One system means data sharing is easier than ever. 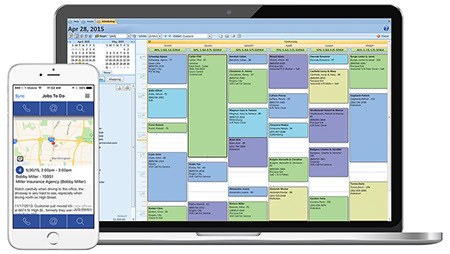 Smart Service janitorial service software provides a simple and easy way to manage your routes and your customers. Your field teams can call or email your customers to let them know you’re on your way, or collect signatures in the field to send back to the office. Your teams can take photo references and you can add them to the customer’s file for future reference. However you want to run your business, Smart Service janitorial service software can help you do it. Smart Service makes sure you never have to juggle filing again. Request a free demo of our janitorial software for QuickBooks! Wipe the floor with the competition with this advice!